FIRST CAME MIAMI: the case of a naked man eating most of another man’s face. Then Maryland, a college student telling police he killed a man, then ate his heart and part of his brain. It was different in New Jersey, where a man stabbed himself 50 times and threw bits of his own intestines at police. They pepper-sprayed him, but he was not easily subdued. He was, people started saying, acting like a zombie. And the whole discussion just kept growing, becoming a topic that the Internet couldn’t seem to stop talking about. CDC does not know of a virus or condition that would reanimate the dead (or one that would present zombie-like symptoms). Preparing for a zombie attack, or other fictional disasters, can provide useful tips to get prepared for a real disaster. 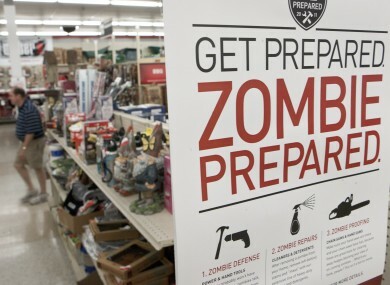 The CDC’s last blog post about zombie preparedness came on 19 May which detailed how the Kansas Divisino of Emergency Management had used a mock zombie invasion to get people thinking about being prepared for disasters. The Hawaii Health Department has also produced an emergency preparedness video entitled ‘Stop the Zombie Apocalypse’ which provides basic information on how people can get ready for “zombies, hurricanes or pandemic flu”. Zombies have been around at least since Mary Shelley’s “Frankenstein” was published in 1818, though they really took off after George Romero’s nightmarish, black-and-white classic ‘Night of the Living Dead’ hit the screen in 1968. In the past several years, they have become both wildly popular and big business. Last year, the financial website 24/7 Wall Street estimated that zombies pumped $5 billion into the U.S. economy. What about weapons? A machete, a crowbar or a spade will probably serve you best. While a bullet will destroy the brain, you will eventually run out of bullets. Choose your base carefully and know all your exits, and more importantly, the entrances. Be prepared to be on the move. A bicycle is an ideal method of transportation according to Brooks. It’s silent and it doesn’t need fuel. The Zombieland movie lays out some very specific rules, including the importance of the ’double tap’. Don’t assume the zombie is dead (again). Go back and make sure. Zombieland reiterates the need to know your exits. When in doubt, know your way out! Always check the backseat of any vehicle you use. Zombies can be a stealthy foe. Maintain your fitness. If you can’t move, you can’t survive. Email “America's disease control centre denies that the zombie apocalypse is coming ”. Feedback on “America's disease control centre denies that the zombie apocalypse is coming ”.